A: I was an apprentice for a high-end designer with celebrity clients. We were designing spaces in the Hamptons and in luxury buildings in NYC and spending SO much money. Every piece was thousands of dollars and had very long lead times. I grew up in the Midwest in a poor family. Spending lavishly was SO tough for me. It didn’t resonate with my values. I wanted to make design accessible to people of all income levels. I was adamant that a lovely home should not just be for the elite. Everyone should be able to afford a home they love. I left my apprenticeship and started my firm, Affordable Interior Design. Q: What are some key factors or decisions that contributed to the success of your business? A: The main factor that contributes to my success is my business name. Affordable Interior Design is our name, our tagline, and our mantra—also, it’s super Google-able which has given us amazing SEO. Secondly, we are very transparent with our pricing and our deliverables. We take the mystique out of the design process. With our packages, our clients know exactly what they are going to get and exactly how much they are going to spend. Q: What are some challenging aspects of your business? A: With our low price point, we need a high volume of clients. We work with 10-16 different clients per week. That is a lot of volume to generate. We were one of the first affordable design models in the business. Now there are SUPER cheap options—even free options. In order to remain competitive, we emphasize our quality. All of our designers have a high-end background in design before working for us. Our clients are truly getting a luxe aesthetic on a budget. Q: Do you feel you made any serious mistakes as you were starting or growing your business? Knowing what you know now, what would you have done differently? A: I wish I would have started my company with a vision of a large firm. When I started, I thought of it as a hobby-business. Then it became just a nice way for me to make a good living for myself. Growth happened to me—not as a result of strategy. I wish I would have started with the strategy. Q: What other advice or words of inspiration would you like to share? A: Join a masterminding group. I recently joined a women’s business group called Savor the Success. I wish I would have found this group YEARS ago. Having the support of other entrepreneurs is invaluable. You don’t have to do it alone. From penthouses in NYC to log cabins in Vermont, we’ve transformed thousands of spaces, achieving high-end looks on real-world budgets. 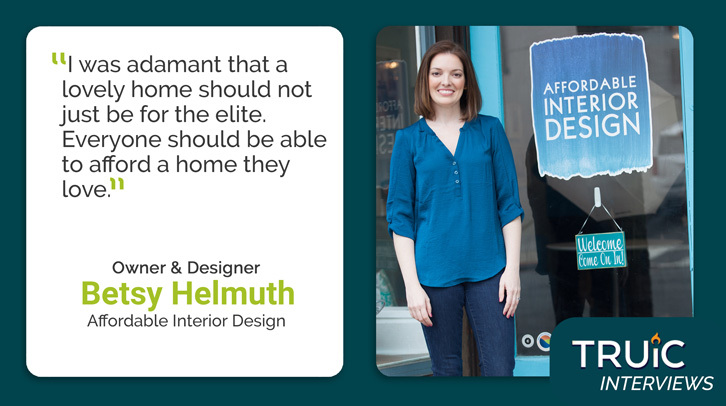 Our designers have worked at high-end places (Armani, Thom Filicia, Inc., The Metropolitan Museum, Soho Grand Hotel, etc.) where we spent thousands on furnishings from exclusive boutiques for our clients. But that's not where we shopped for ourselves. We translated luxe looks to fit our budgets at places like West Elm, Overstock, & IKEA. In 2005, our founder had an ah-ha moment: "Let's do this for our friends, our family, everyone we know!" And, just like that, Affordable Interior Design was born. Our passion is creating upscale looks--for so much less!